Research from the field is presented with special attention to how program structures affect outcomes of these practices and helps practitioners answer the question, "Does it work?" Each review article is followed by commentaries from noted scholar–practitioners in each area of practice that help readers consider the questions, "How well does it work?" and "What are our next steps?" Terry Amsler, Ariel C. Avgar, Linda Baron, Jennifer Batton, Lisa B. Bingham, Robert B. Coates, E. Franklin Dukes, Kirk Emerson, Timothy Hedeen, Tricia S. Jones, Joan B. Kelly, John Lande, David B. Lipsky, Rosemary O′Leary, Donald T. Saposnek, Mark S. Umbreit, Betty Vos, Roselle L. Wissler, and Howard Zehr. 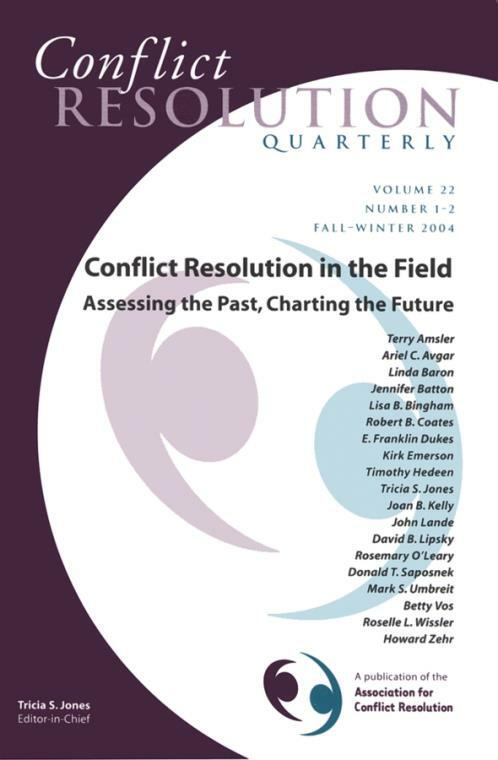 This is the 22nd Volume, Issues 1–2 of the quarterly Jossey–Bass journal Conflict Resolution Quarterly.